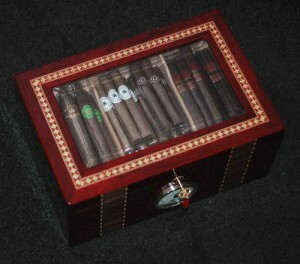 Storing cigars properly is important because it may compromise its taste and quality. Once it is left in the open, it will dry up just like a flower. Mishandled cigars may burn unevenly or faster than usual. They can have a strong bitter taste and even broken wrappers. Molds and insects also pose a problem. Prevent these by keeping cigars below the maximum temperature of 73F (23C) and within 68%-74% humidity. The ideal environment would be 70F (21C) and 70% humidity. Cigars that are not stored in a humidor must be kept in a sealed plastic bag with a damp towel. ?They often last a week or two, depending on the weather. Do not store them in the refrigerator, because they will lose their moisture. Although in some cases, it is acceptable to freeze them to avoid insect infestations.